Born Dec 13 19172,3,4,5,6,7,8 [Dec 12 19179], Wooster, Wayne County, Ohio2,3,4,5,6,7,8. 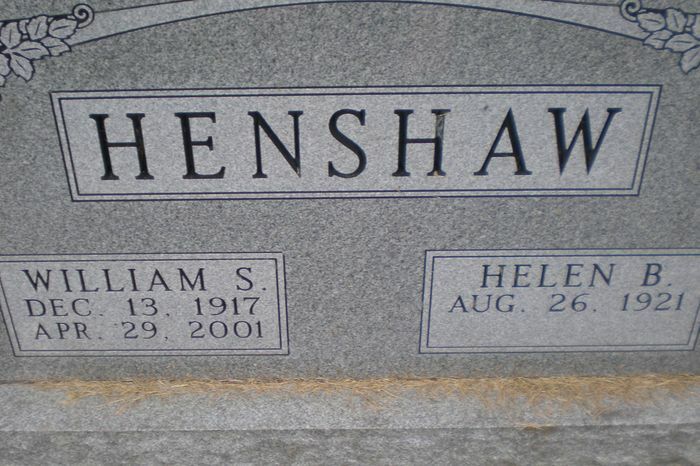 William Stewart Henshaw died Apr 29 20016,7,8,10,12,13 [Apr 1 20014], at his home, Wooster, Wayne County, Ohio6,7,8,10,12,13; age 836,7,8,10,12,13. William Stewart Henshaw, 83, 3731 E. Smithville-Western Road, died Sunday morning, April 29, 2001, at his home. Memorial services will be Wednesday at 11 a.m. at Wayne Presbyterian Church, with the Rev. Robert Meyer officiating. Private burial will be in the church cemetery. The family will receive friends following the services at the church. Arrangements are being handled by McIntire, Davis & Greene Funeral Home in Wooster. Those who wish may make contributions to Wayne Presbyterian Church, 7152 Burbank Road, Wooster; Hospice of Wayne County, 2525-A Back Orrville Road, Wooster 44691; or to the Kidney Foundation of Wayne County, 5318 Tannerville Road Orrville 44667. He was born Dec. 13, 1917, in Wooster to Luther and Haddie (Porter) Henshaw and married Helen B. Wylie on Jan. 18, 1945. She survives. Other survivors include children, Thomas D. (Patricia) Henshaw and Douglas (Cynthia) Henshaw, both of Wooster, Janet (Ben) Hickey of Fremont and Joan (Ed) Millspaw of Austinburg; nine grandchildren; sisters, Mary Cottrell of Washington, Iowa, Adelaide Lawton of Lodi and Helen Sleesman of Groveport; and a brother, John Henshaw of Wooster. Obituary of William Stewart Henshaw.